If you stay up just a bit later on Sunday, May 23rd, after watching the series finale of Lost, you’ll see a live special called Jimmy Kimmel Live: Aloha to Lost. According to ABC, the hour-long special will feature host and Lost-addict Jimmy Kimmel as well as castmembers Naveen Andrews, Nestor Carbonell, Alan Dale, Jeremy Davies, Emilie de Ravin, Michael Emerson, Matthew Fox, Daniel Dae Kim, Terry O’Quinn and Harold Perrineau. Jorge Garcia, Josh Holloway and Evangeline Lilly will also make “special appearances” (presumably pre-taped). Executive producers Damon Lindelof and Carlton Cuse will certainly appear via pre-recorded footage. As has been previously reported, Lindelof and Cuse plan on “going into hiding” after the finale has aired to avoid being deluged with questions about what it all means. 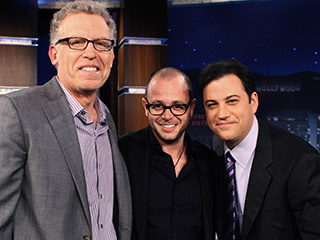 The Kimmel special is also going to include an exclusive look at three alternate endings to the finale. No other details have been given. Back in 2008, Good Morning America aired two alternate endings to the season four finale. If you recall, the last shot of the season showed John Locke (O’Quinn) in a coffin. The alternate scenes showed Sawyer (Holloway) or Desmond (Henry Ian Cusik) in his place. Cynics have surmised that these might be joke endings but ABC’s press release makes it clear that the clips have come from the executive producers. Jimmy Kimmel Live: Aloha to Lost will air at 12:05am on Monday, May 24th. What do you think? Do you think the alternate endings will shed some light on unanswered questions, raise even more questions, or be part of a joke? Ha. Could this mean the finale will be avoiding a few key questions or possibly leave a cliffhanger ending? That would be something. I simplay cannot wait–every new episode leading to this leaves me so much more intrigued–you can bet I will have my eyes glued to the televison for all of this on May 23rd, but then I am now going to have to find an new show to sink into and so far nothing has caught me like the “Lost” bug did. Will be watching. oh man I can’t wait for this.